(Bloomberg) -- French President Emmanuel Macron, facing a slide in his popularity, defended his record and said he hadn’t forgotten the nation’s poor. Speaking in front of a joint session of the two chambers of parliament in Versailles, Macron said he had no plans to slow down his pace of seeking to transform France, while warning that it might take “a long time” to feel the economic effect of labor and tax changes he has pushed through. On his reforms agenda: cuts in government spending to be announced in the coming weeks, negotiations on reforming job training schemes and unemployment insurance starting later this month and an overhaul of France’s state pension systems planned for 2019. At the same time, he pledged to boost military spending and invest in new technologies. “I want France to become a power of the 21st century,” he said. Macron, who came to power promising a mix of policies combining both center-left and center-right parties, has come under attack for tax cuts and labor liberalizations that many French see as benefiting mostly companies and the wealthy. Macron defended his efforts to boost economic growth, while at the same time promising anti-poverty measures to take effect in 2019. He also promised improvements to the health and education systems to break what he said is increasing class rigidity. The 40-year-old president, France’s youngest ever, has seen his popularity slide since his May 2017 election, also hurt by recent distractions such as building a swimming pool at a presidential residence in Southern France, replacing the tableware of the presidential palace with an expensive new set and telling off a teenager who spoke to him in a casual tone. 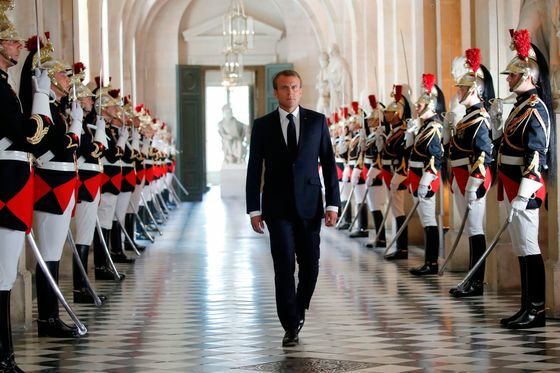 An Odoxa poll published July 5 for Le Figaro said 71 percent of the French think Macron’s policies are unfair, 65 percent think his policies are inefficient, and 55 percent think his Monday speech is unnecessary. An Elabe poll for Les Echos also published July 5 said almost the same: 76 percent found his policies unjust, and 66 percent inefficient. An Elabe poll published July 6 said Macron’s approval rating fell six points in the month to 34 percent, just three points above predecessor Francois Hollande at the same point of his presidency. At the same time, he confirmed that France will spend 15 billion euros ($17.5 billion) on job training over his first five-year term. Following a constitutional change in 2008 pushed through by then President Nicolas Sarkozy, French presidents can summon the lower 577-seat National Assembly and the upper 348-seat Senate to Versailles for a joint session. Macron spoke to Congress in July last year and said he’d renew the exercise every year. In contrast, Macron is breaking with his predecessors’ tradition of addressing the nation on Bastille Day this Saturday. Some members of both the center-right and far-left opposition boycotted the session, saying it was unnecessary and monarch-like.